Longmoor Pool was made in 1734. The dam has been strengthened since it was first made - you can still see the quarry at the east end of the dam where the material for the original earth dam was extracted. Permission to make the dam had to be given by the Warden and Society, and this was given to Mr John Ryland in February 1734. He was to lease the Pool for 21 years at one shilling per annum. The pool, near Banners Gate, has adorned the Park ever since. John Ryland may have wanted the pool for sport - fishing and duck-shooting - or he may have intended to use it to power a water mill. A mill was built below the dam using water from the pool to turn its waterwheel, but this was not done until twenty years later. In March 1754 the Warden and Society granted a lease to Richard Reynolds, a wheelwright by trade. He was to erect a house, watercorn mill and dressing mill there “for the more commodious grinding of corn for the inhabitants of Sutton Coldfield and other adjacent parishes”. He could also have four acres of land next to Longmoor Pool to grow crops. The lease was for 63 years at £2.00 per annum. Reynolds was allowed to build a lean-to at the mill for dressing leather in 1757, but the corn grinding was not a success, partly due to the remote location of the mill. In 1760 Reynolds was granted permission to convert the mill for other uses. By this time nearby Birmingham was growing as a manufacturing centre with many specialised trades, and for the next fifty years the mill at Longmoor was known as the Button Mill, polishing buttons for the trade. In the nineteenth century the mill reverted to corn grinding to satisfy the demand for flour to feed the growing population. The mill fell out of use in the twentieth century, and was demolished in 1938. It is hard to see any trace of the mill and miller’s house now, but the pool is back almost to its original purpose - fishing and bird-watching. 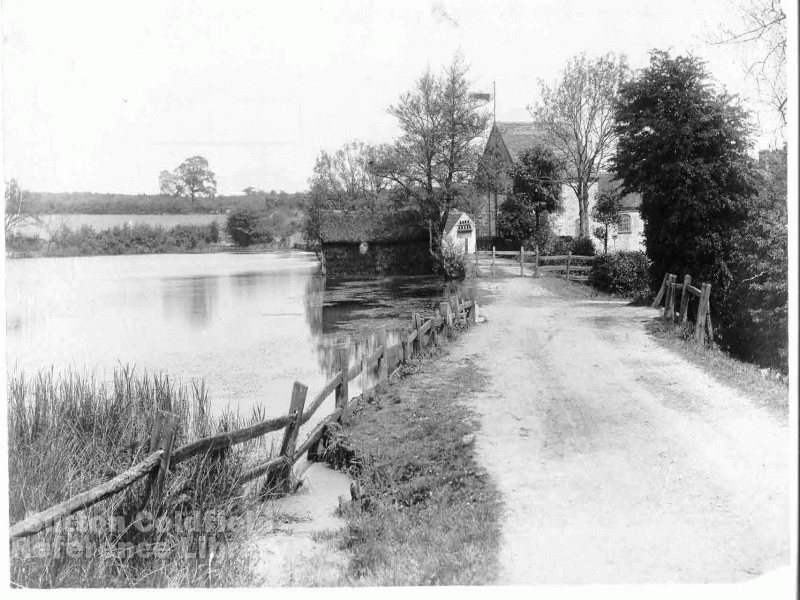 Longmoor pool and mill as they were 100 years ago.